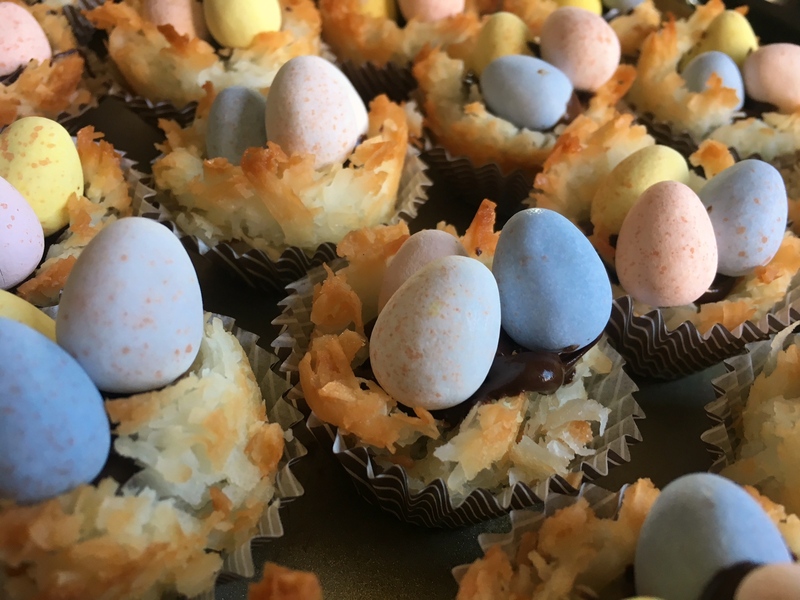 Coconut Macaroon Nests will totally be on the table at Easter brunch next weekend. Although they’re a bit messy to make, they look adorable and taste great. Feel free to make these a day or two ahead so you have less to manage on Sunday. Heat oven to 300. Coat mini muffin pans with non stick cooking spray. 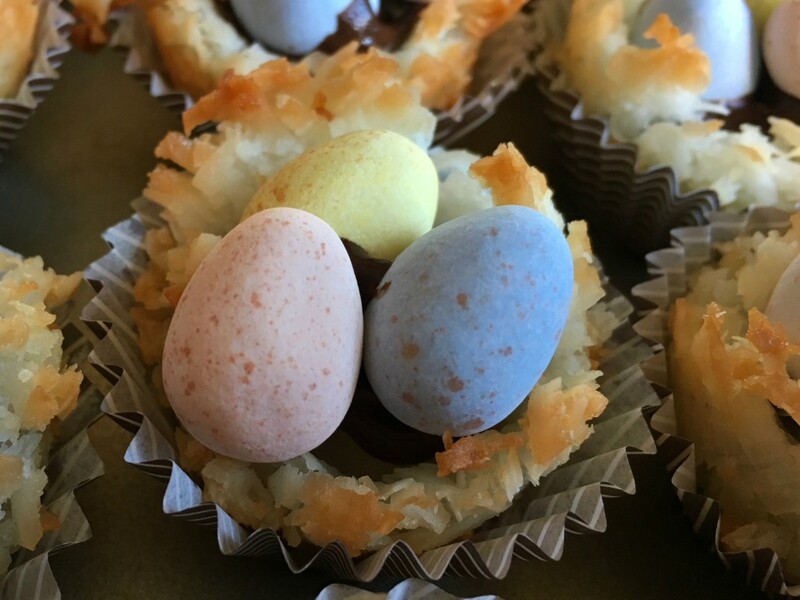 Use a stand mixer to combine egg whites, sugar, salt, vanilla, coconut and almond extract. Mix briefly. Add shredded coconut and mix until combined. Scoop 1 T blobs of coconut into the prepared muffin pan. Grease a smaller item (I have a narrow bottomed shot glass) such as wine cork and gently press it down into the coconut to create the nest-like shape. It can be messy, it will look like twigs after you bake it. Bake for 30 minutes until nests set and edges are golden brown. If it’s browning too quickly, cover the pan with foil. Set aside and cool completely. Carefully remove nests from pan. I used a small spatula to wiggle around the edges and pop them out. You WILL lose some… I started with 30 and ended up with 24 intact. It just happens. Carefully melt chocolate chips in a plastic bag in the microwave, using 30 second intervals and checking often. 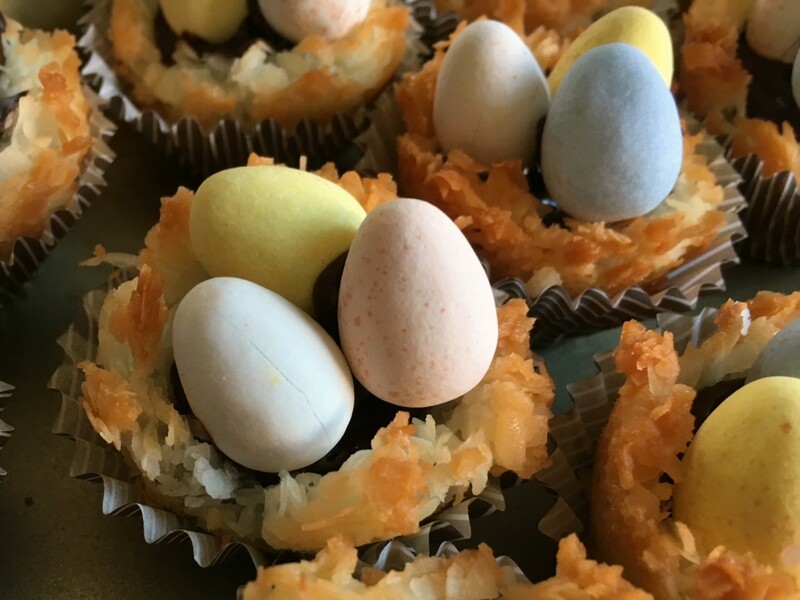 Drizzle into nests and carefully stick the eggs to the chocolate. Feel free to put a bit of chocolate on the back of an egg to “glue” it to the others. Cool completely and serve.